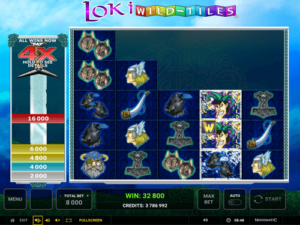 Loki Wild Tiles is a different sort of slot game from Novomatic. It’s not a traditional slot but it does resemble one in many ways. Other games from Novomatic that are like this one are: Gems Wild Tiles and Bling Bling Wild Tiles. This particular Wild Tiles game has been inspired by Norse mythology. In Norse mythology, there are nine worlds, connected by a central tree. One of the nine worlds, Asgard, is where the Gods live. There are many Norse Gods and Goddesses, the most famous of which are probably Odin, Thor and Loki. These Norse Gods have been made even more famous lately thanks to the new Thor films starring Chris Hemsworth and Tom Hiddleston. Norse culture and Norse mythology are celebrated in this Novomatic slot game. Loki Wild Tiles has a Valhalla bonus that gives enormous amounts of cash! According to Norse mythology, Valhalla is a great hall located in Asgard, where half of all battle heroes go when they die. The other half go to Folkvangr. When you’re playing this online game, you’ll feel yourself saying ‘to Valhalla!’ just like the Vikings did. You can play at your own pace or you can put the autoplay feature on in Loki Wild Tiles. Other Norse-inspired slots from Novomatic include: Viking & Dragon and Spirits of the Valkyrie. There aren’t any paylines as such in this slot game, which is unusual. So, all you need to do to is set your bet by using the plus and minus buttons to increase or decrease to an amount you’re comfortable with. This is how much it will cost you for one spin. However, the reels don’t really spin in Loki Wild Tiles. It’s more like the symbols tumble into a 5x5 grid. Any line of 3, 4 or 5 identical symbols will pay a win and then they will disappear. They just have to fall in a line. Horizontal and vertical lines both count! No new symbols will fall in their place. However, the wins can keep on coming as the other symbols on the grid will continue to tumble down. If they land in positions where they create more lines of three or more matching symbols, they’ll disappear too! This will keep on happening until either there are no more lines of matching symbols, or the grid is completely clear. It’s kind of like Tetris but crossed with a slot game! It’s really fun to play and these tumbling symbols will keep you entertained for hours on end. The symbols in Loki Wild Tiles all have something to do with Norse mythology or Norse culture. Loki is the Wild symbol in this Novomatic casino slot game and he can fill in for any other symbol when completing a winning line! He appears in the normal game when the middle symbol(s) of a winning line turns into Loki! The normal symbols are: the raven, the wolf, the Viking horn, the Viking and Thor. Every payout you win will be displayed in the column to the left. The more wins you get, the bigger the multiplier will get for that round! The bonus in this Novomatic casino slot can’t be triggered on every spin. On some spins, the grid will be empty and if you clear it then nothing will happen, except you’ll get a big multiplier thanks to all your wins! On special spins, however, the symbols will hide the word ‘Bonus’! If you get enough wins to clear all of the symbols to reveal the entire word, you will trigger the Valhalla Bonus. To Valhalla! This is a totally different game played with a whole new set of symbols! You get 10 spins to start with. During the Valhalla Bonus, symbols don’t necessarily have to fall in a line to win! Any 5 matching symbols, no matter where they land, will give a win in the Loki Wild Tiles Valhalla Bonus! The paytable shows all of the ordinary payout amounts and the bonus payout amounts so you can open this and look for more information. The bonus symbols are also inspired by Norse culture. There’s a hammer, an axe, a dragon coin, a ship coin, a tree, a horn, a sword, a double sword and a helmet. In the Valhalla bonus, when you get a win consisting of 5 or more Loki symbols, you will win 5 additional spins! In one Valhalla bonus, you can get up to a total of 30 spins!